Sometimes we get into such a pattern of preparing foods we’re used to that we don’t get to have fun experimenting. Break free from old habits and still enjoy your go-to comfort foods with these fun twists on old favourites. 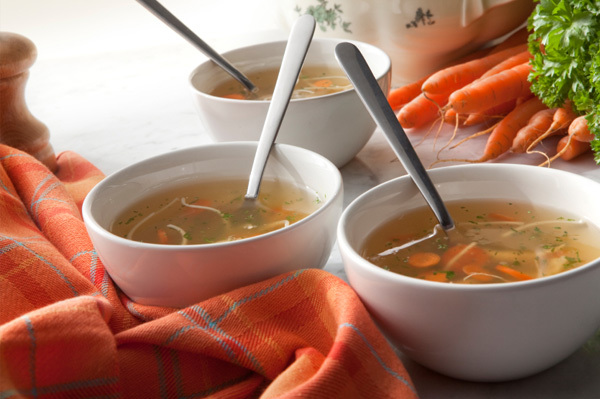 Nothing comforts a queasy stomach like a good, old-fashioned bowl of chicken noodle soup. The combination of warm broth, soft veggies and tender chicken is easy to digest. But if you’re looking to switch things up a little, consider subbing something new in for your average noodles. Wild rice, orzo or Israeli couscous are great options. You can also spice it up by tossing in a pinch of hot chili pepper or paprika. For a truly new twist, whip up a batch of chicken ravioli soup — your family won’t be able to get enough of the stuff! Everyone loves the soft, warm goodness of a good grilled cheese sandwich. But it doesn’t have to just be a slice of processed cheese squished between two pieces of white bread. There are lots of fun ways to dress up a grilled cheese so well, you’d be perfectly happy to serve it for dinner or to guests. It’s really all about picking the right bread and cheese combination and then throwing in some extra toppings for a dramatic flair. For a delicious sandwich your kids will devour, try a gruyere, cheddar and apple grilled cheese on sourdough bread. The blend of creamy cheeses along with the softness of the sourdough and little bit of fruity crunch makes for a sandwich they’ll have trouble putting down. When entertaining, the dip selection can make or break the appetizer table. So presenting your guests with delicious dips they’ve never experienced before can really get the party started right. Hummus and guacamole are the go-to chip-dippers and, though perfectly good options, there’s no harm in experimenting a little. A white bean and artichoke dip, for instance, has a texture similar to hummus but with a fun Mediterranean flare. Or, add a taste of the tropics to your event with an exciting fruit kebab dip. Everyone enjoys a good piece of pie to end a meal. But, as delicious as it may be, it doesn’t always have to be Grandma’s family recipe. The types of crusts, fruits and fillings are endless, so feel free to let your imagination run wild. For a quick and easy change, use your go-to pie recipe but sub in a berry you’ve never tried before. Gooseberries or saskatoon berries are a great place to start. Or, for a fun change, consider opting for mini pies rather than one big one. You can use any of your favourite pie recipes and simply divide the ingredients into the separate containers of a muffin tin, adjusting the cooking time accordingly. Your family or guests will enjoy the suprise of each having a pie all to themselves. With a couple of simple alterations, you can enjoy any of your old favourites in new and exciting ways!